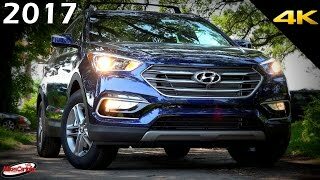 Hyundai is there with its new model Hyundai Santa Fe Sport 2017. 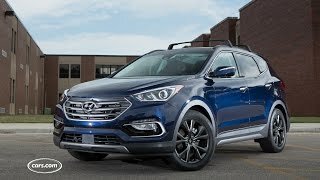 The company is slightly lagging behind when it comes to crossover and the SUV roster which puts the extra pressure on the newer addition and brings the makeover Santa Fe Sport 2017. The Santa Fe debuted in the year 2001 as the brand’s first ever SUV and a second generation five years later. Let us have a close look the reviews of the Hyundai Santa Fe Sport 2017 and get to know more about the gestures it contains. The interior of Hyundai Santa Fe Sport 2017 comes with the newer look. It is being updated with the center stack, with new button placement, which complements a full suite of infotainment options. There is a 5.0-inch color LCD screen for audio control on the Santa Fe Sport. Additional options include a power passenger seat with height adjustment and a panoramic sunroof. There is a beautiful work inside with leather upholstery and woodgrain trim with a matte finish. It is also provided with the height-adjustable passenger seat. The Standard features include a remote keyless entry system with alarm, steering-wheel mounted controls for the sound system and cruise control, and Bluetooth hands-free phone integration. There is a new standard seven-inch touchscreen display with Android Auto. The safety features of the model include adaptive cruise control with start/stop functionality, lane departure warning, an electronic parking brake with auto-hold, forward emergency braking with pedestrian detection, adaptive headlights, and a multi-view camera system for enhanced around-vehicle visibility. 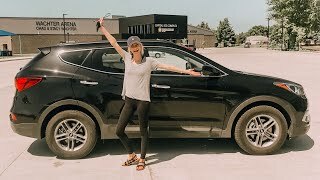 Entire interior of the Hyundai Santa Fe Sport 2017 is adorable in the look. 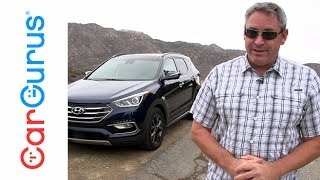 The exterior of Hyundai Santa Fe Sport 2017 comes with a hilarious and a handsome look. The company offers with the two individual models – the two-row, five-passenger Santa Fe Sport and the Santa Fe. The two-row Santa Fe Sport comes with horizontal fog lights and three slats in the grille. There’s bolder grille with more chrome, new LED running lights slipped between the restyled headlights and reworked fog lamps, refreshed bumpers, revised exhaust outlets, and a new screen and controls for the infotainment system. At the sides there is a new rocker panel trim, integrated silver accents, and exterior side-view mirrors with a standard heating function. Wheel designs are new as well, with 17-, 18-, and 19-inch alloys. The redesigned headlights now get LEDs for the daytime running lights, while the three-row Santa Fe is offered with available LED fog lights. An automatic on/off function for the headlights is standard. Entire external features of the Hyundai Santa Fe Sport 2017 offer it a handsome look. Hyundai Santa Fe Sport 2017 comes powered with the 2.4-liter four-cylinder direct-injected engine. It provides a power of 185 hp and the torque 241 nm of mated to a standard 6-speed automatic transmission, getting 21 mpg city/27 highway/24 combined with FWD and 20/26/22 with AWD. Santa Fe engines utilize high-pressure direct injection and Dual Continuously Variable Valve Timing. This makes the model to be sportier and compete with its lineup models. 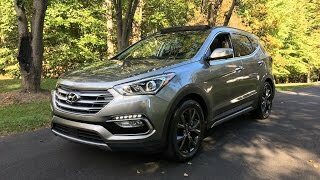 The top speed of the Hyundai Santa Fe Sport 2017 is yet not shared by the brand.